A comprehensive synthesis of Caribbean prehistory from the earliest settlement by humans more than 4000 years BC, to the time of European conquest of the islands. The Caribbean was the last large area in the Americas to be populated, and its relative isolation allowed unique cultures to develop. Samuel Wilson reviews the evidence for migration and cultural change throughout the archipelago, dealing in particular with periods of cultural interaction when groups with different cultures and histories were in contact. He also examines the evolving relationship of the Caribbean people with their environment, as they developed increasingly productive economic systems over time, as well as the emergence of increasingly complex social and political systems, particularly in the Greater Antilles in the centuries before the European conquest. 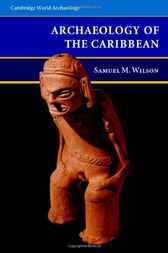 Wilson also provides a review of the history of Caribbean archaeology and the individual scholars and ideas that have shaped the field.